GMA: You’re looking at Elizabeth Mitchell, in a scene from “v,” the sci-fi story about human fighting aliens. She plays an F.B.I agent, Erica Evan, risking her life to get to fight the invaders. EM: Really good, you made it sound so really good. I liked that. That was very good. GMA: “V” is for visitors, right? EM: “V,” is for visitors. Or victory. Depending on what show…yes, but absolutely. GMA: So you’ve been on “v,” and “LOST”. I would love to see your e-mail list. EM: My e-mail list is pretty good. I have a password on my phone because I’m afraid it will get stolen. I have assumed names for everybody. It’s good. In season six, following the electro-magnetic blast that took out Juliet (Elizabeth Mitchell)—perhaps the most interesting character—dual storylines were employed: one where the bomb didn’t work and everyone was left on the island, and another where it did work and everyone survived the Oceanic flight, albeit with some peculiar differences. This is a pic from LOST OFFICIAL MAGAZINE N° 30. 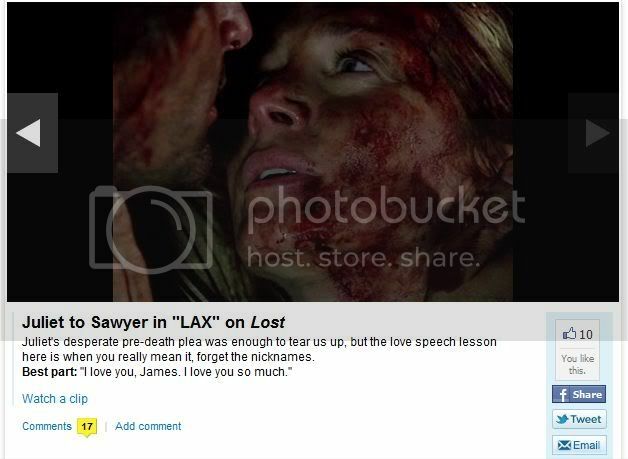 Source: Sawyer & Juliet Fan – Thanks Lexi!